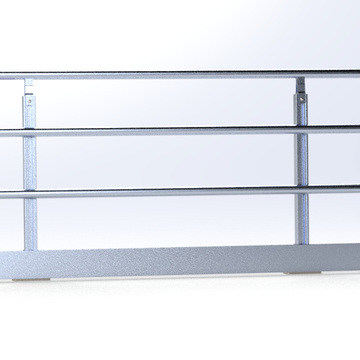 Alphastrut® balustrades are the stylish and corrosion resistant aluminium handrails perfect for use in the commercial and industrial property sectors. Made from high grade aluminium extrusions, Alphastrut balustrades were designed to be quick to install and adaptable enough to work in settings ranging from banisters in office buildings to safety rails in chemical plants. They are a practical choice for any project and also offers significant savings in both material and fit-out costs compared to many alternative handrail products. Why specify Alphastrut balustrades for your project? Alphastrut balustrades offer a range of financial and practical benefits that make them the perfect handrail choice for a wide variety of projects. Adaptability - they were developed to be adaptable enough to fit any layout and can provide an unbroken rail even around corners and when used as a bannister in stairwells. Whether your project is internal or external, Alphastrut balustrades will work. Cost - Alphastrut materials are cost competitive against steel and composite handrails, with the additional financial benefits of quick fit-out times helping to make it an even more attractive option. Simple installation - Alphastrut balustrades were designed to be quick to fit, whether used for new developments or retrofit work. They have a fully bolted and clamped design, with no obstructive fixings on the rails and fully adjustable connection details for stair and wall fixing. No welding is needed, the aluminium can be cold cut on site and there is no cut end treatment required, saving time and reducing the need for skilled tradesmen. Improved site safety - manual handling is much easier with Alphastrut balustrades than with steel handrails, as aluminium is significantly lighter than steel. The lack of requirement for hot works further reduces risk. Strength - Aluminium has an excellent strength to weight ratio, meaning Alphastrut balustrades are as strong as steel handrails despite being significantly lighter. Alphastrut’s properties also mean the balustrades will keep their structural integrity when struck by an external force and any damage will be picked up by a simple visual inspection. Corrosion resistance - Alphastrut balustrades benefit from exceptional corrosion resistance and have a long lifespan in both internal and external settings. 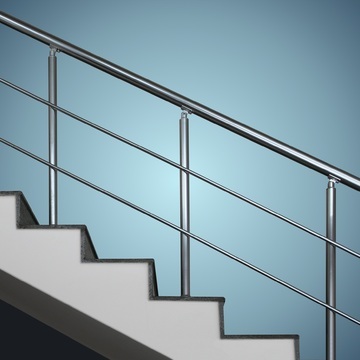 They do not require painting for external use and can cope with aggressive environments in which more expensive stainless steel handrails are often specified, such as ports and factories. Aesthetically pleasing - while Alphastrut balustrades have a wide range of technical and practical benefits, they were also designed to be stylish enough for use in commercial buildings. If required, they can be supplied powder coated in a standard RAL colour. 100% recyclable - Alphastrut balustrades are made from 100% recyclable materials, so will fit with any environmental policy. Contact Multi Metals to request a quote or further information about Alphastrut balustrades. Contact Multi Metals today to discuss how Alphastrut balustrades could reduce costs and fit-out times on your project.